I can’t tell you how excited I am to know that readers can finally hold the first issue of Broadview magazine and visit us online. This project started as a kernel of an idea about two years ago and has consumed the working (and waking!) hours of everyone here at the magazine ever since. Many of you will know that until this month, we were called The United Church Observer and that our history stretches back 190 years to 1829. Broadview is a new name, the fourth in our history, but our vision is about so much more than a rebranding. We want to create a magazine that serves a thoughtful audience of progressive Christians — as well as those with similar core values. We want Broadview, both in print and online, to share stories about ethical living, social justice and spirituality. It will offer high-calibre journalism and provide readers with hope amid the challenges of our world. It will also inspire us all to act. Most importantly, our hope is that Broadview will become a community of like-minded souls. This vision has only become a reality because of the cracker-jack team behind it. Our new art director, Carol Moskot, has designed a beautiful magazine that’s bold, fresh and engaging. We worked with a printer for a higher quality look and feel that our dedicated subscribers can relish and new readers will notice on the newsstand. The first issue of Broadview. We consulted with experts in publishing, circulation, advertising and fundraising to modernize the business side of our operation. Digital designers brought Broadview.org to life. Our talented staff editors pulled together a diverse group of freelance writers, photographers and illustrators to create the very best publication we could muster. 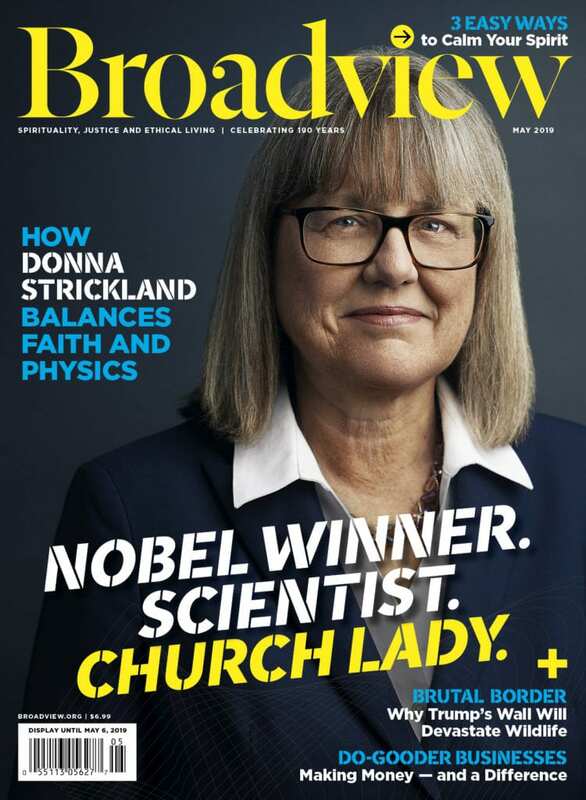 This month, I’m particularly pleased that Donna Strickland, the Nobel Prize-winning physicist — and a church member from Waterloo, Ont. — appears on our cover. We chose acclaimed science writer Alanna Mitchell to craft the accompanying profile of Strickland, which explores how she and other scientists of faith balance knowledge and belief. Strickland’s story, as told through Mitchell’s superb writing, is both challenging and inspiring. I can’t think of a better story to launch this magazine. So here it is — a big moment in our history and our future. Broadview is the result of a lot of hard work from a big team of people. We care deeply about magazine journalism, and about continuing and evolving an important legacy in Canadian publishing. We hope you enjoy reading this issue as much as we have loved putting it together. Looks great; reads well; makes me proud as a United Church member. You should come and visit us at Montreal City Mission in Montreal, learn about our new SAGE Mission model, and help us shape a renewed United Church commitment to ongoing dialogue with Muslim communities in Montreal, Quebec and Canada. I was pleased to see you use the words. "Thoughtful audience of Progressive Christians" in your May magazine introduction. Many Christians are seeking some 'progression' rather than hanging onto a model 2000 years old and suited to those times. Alana Mitchell is to be congratulated on the clear article about Dr. Strickland that weaves back and forth just beautifully. Lots in the piece for the modern person. Hope we see more of Ms. Michell's interesting and clear writing. As a long time reader of the Observer I would appreciate a more fulsome explanation as to why it was thought that a new name was necessary. I often find name changes as simply attempts to rewrite or deny history, be it cities (Leningrad), magazines (The Beaver), companies (Great Canadian Oil Sands Ltd.). If a captain wants to change the course of his ship, he should steer a new course. It does more harm than good to remove the rudder in the hope of replacing it with a new one. Hidden plastics rarely get recycled and often can’t be reused. Here we make some of the invisibles visible.